B”H our first year has gotten off to a great start as many of you have been following in the updates. I don’t know of a single Talmid who is unhappy in Monsey and the boys are all very happy with their decision to come to Mesivta Lev Tmimim Lubavitch. Apparently, from the reports I’m hearing from the greater community, from the fact that we are still receiving applications (and unfortunately having to turn people away due to lack of space and resources), the parents, are sharing positive feedback with their communities and friends. I thank you for this, and for all the emails of personal feedback that they’re providing me with. It is greatly appreciated – both the positive, as well as the constructive. 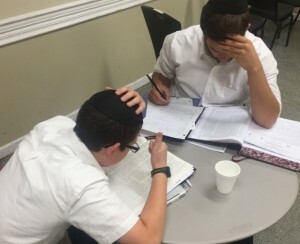 Due to the unique approach of our Yeshiva, some in the community have a difficulty understanding who we cater to and mistakenly believe that this is a school for “certain types of students”. The truth is that the very reason for our founding is to change this is very paradigm. If you’ve ever felt that since your child is a good student, a bright boy, and therefore never gets the attention and care that he deserves, and that his teachers have paid more attention to the weak, or “trouble making” students, then you will understand exactly what we are about. In a nutshell, Mesivta Lev Tmimim Lubavitch was established in order to provide, what I feel was a specific niche that was lacking in Chabad Mesivta education. There are quite a few wonderful Yeshivas that provide high quality learning, with very capable Hanhola and Rebbeim. There are also excellent Mosdos catering to the needs of special populations such as boys who are “at risk”, or who are questioning their place in the Chabad or Jewish community, as well as boys with special learning or emotional needs. All these Mosdos are doing amazing work and seeing great results. A school that will actively challenge and engage their son preparing him for leadership and success in life. and all this in a traditional Lubavitch Mesivta environment, that will allow them to continue on to any Zal as any other Talmid graduating from a Chabad Mesivta would. I am stressing once more that these goals, the very same goals that are stated on this entire website and Mission Statement have not changed. We are committed to following through and this is our very raison d’etre. The school’s foundation is the Chabad Yesod of love of another, guiding the students to develop a personal connection with our Creator and listening to the individual students’ concerns. Our vision was to create a program with the foundation of Chabad values, that incorporates traditional studies in Limudei Kodesh for average to advanced mainstream Bochurim, side by side with a secular (Limudei Chol) skills curriculum, culminating in a NYS Regents Diploma. We achieve this without the compromises that often result from programs that are not full day Kodesh. The underlying premise is to maintain an environment true to Chabad values on all levels. We see the nurturing of emotional wellbeing, personal growth, and devotion to the student as a basic need of EVERY student , something that is, sadly, often provided only to our not yet Frum Mekuravim on Shlichus or to teens at risk and in trouble. We felt that all the resources, creativity and care that goes into our outreach and remedial programs should be invested in our mainstream, healthy, Chassidishe children BEFORE they CH’V arrive in those situations. Please take the following words in context of the above. Our staff and myself are fully devoted to each one of our Talmidim. And we will dedicate whatever resources we have to helping him succeed. But the underlying condition is that both he and his parents must want what our Mosad is offering. As declared on our home page, we value a Talmid, not by his academic or external achievements, but by his essence, a Chelik Elokah. And we will not turn away a Talmid who would like to grow and achieve. However, I must stress again, that Mesivta Lev Tmimim Lubavitch is not a Yeshiva for students questioning, or “rebelling” against Yiddishkeit, nor for students with special emotional or behavioral needs. Although that population is just as deserving of the opportuinites to grow and succeed, and our community must help them equally, MLTL does not have the resources to provide those services. Unfortunately, in any Yeshiva and any organization, the needs of the Prat must always be weighed against and in relation to those of the Rabim, and if helping one boy will cause harm to many more, then it is clear that their is no overall benefit as one boy’s success can not be at the expense of others’. We have, sadly, had to dismiss a few boys already who were denying their Chaveirim the opportunity to grow in an atmosphere of Tahara and Kedusha. I stress to the boys many times that I am not here to make them “religious” (although I hope that through the learning and atmosphere we provide, we will be Matzliach in inspiring them) and matters Bein Odom LaMakom are their personal business. But at the same time, any kind of external behavior, dress, or other expression, that will affect the atmosphere of Chassidishkeit and Yiras Shomayim of the Yeshiva is not acceptable. As such, we are very clear with the guidlines of dress, speech, television/movie and interent usage, keeping times of Sedarim, etc. and are not tolerant of ANY infractions in these areas. In general, a boy who feels that this environment is stifling or too demanding should consider if this is the right place for him. A boy who is not seeking a true, traditional, Tomchei Tmimim atmosphere of Taharas Hakodesh is asked to reconsider why he wants to be in MLTL. Likewise, the parents must want this kind of Chiunch as well. Again, we are not judging anyone’s observance of Yiddishkeit, but a family that has different values than those that we are striving for, is not a good match for MLTL. As mentioned above, there are other Mosdos that do cater to more flexible needs and are tolerant of a wider range of Yiddishkeit observance and Chassidishkeit. And, Aderaba, if a boy is not feeling comfortable in our environment, then the parents should consider strongly whether trying to force him to be in one will possibly backfire and make him more resentful. If your son questions the requirement to Daven, for example, or the importance of being a Lubavitcher Chosid, or the messages he gets from home and the things he is exposed to there are contradictory to the Yeshiva’s, then this is not the Mesivta for him. Of course, we all have questions in our personal growth and we allow any Talmid to ask anything, but the underlying assumption is that a Talmid that comes to our Mosad is coming here because he wants a purely Chabad Chinuch and will not feel constricted when these expectations are made of him. While we are very stringent in our dress code, expectations of Yiras Shomayim behaviors, and general behavior, our curriculum is very warm and varied, and we are very liberal with our programming in that we expose our Talmidim to a broad range of (kosher and acceptable) experiences – but – and I stress – we are not a Chabad House, or a place for “at risk” or disturbed children, and we will demand the highest level of Yiras Shomayim and Chassidishkeit in the atmosphere that we are creating and for the home to mirror that commitment. We certainly will not allow the slightest amount of harmful exposure to other boys by any Talmid. We must have the full support of the parents in order to continue making this Mesivta a success for all the Bochurim, and if a parent is not comfortable with this level of expectation both in Yeshiva as well as in the home, then please consider seriously before submitting an application. As always, please feel free to contact me with any matter you would like to discuss further. I can be reached at the number above. A Chassidishe and Pure atmosphere. Really. These are not just website claims. Ask any of our Talmidim or parents. Your son WILL be held up to these standards and there is no room for leniency in these matters. Very demanding and strict in regards to Levushim/Fashions, internet/cell phone matters, and Shmiras Hasedarim. Level of learning is broad. We have three Magidei Shiurim per grade, as well as tutors available so we cater to the high level learner as well as the one struggling without either losing out – this includes the average level learner as well, who in many cases are the ones to suffer the most. Personal attention and emotional wellbeing. This does NOT imply professional psychological support for disturbed boys, or children in need of special attention but rather healthy Chinuch for all students. We believe that every Talmid deserves a very warm, caring and supportive staff that is attuned to his needs, successes and failures. Our curriculum is designed to support this philosophy. The opportunity to learn essential Limudei Chol skills and work toward a High School diploma without being in an atmosphere that compromises on Chassidishkeit and Yiras Shomayim. Curriculum which includes focus on personal responsibility, social well-being and team building among the Talmidim, as well as physical education and health.